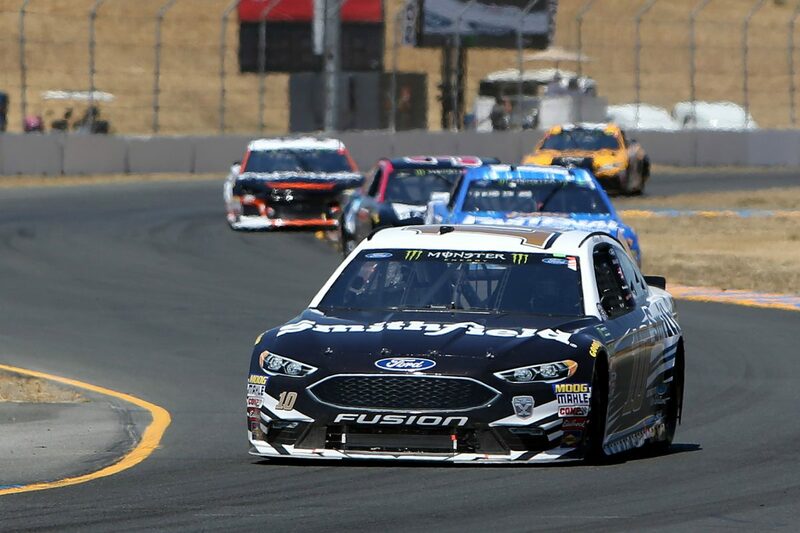 Aric Almirola started Stage 1 in the 24th position at Sonoma (Calif.) Raceway and completed it in the seventh spot to earn four stage points. On lap 10 Almirola reported the Smithfield Ford was “tight everywhere,” but he was able to continue to pass his competitors. By lap 18 the Tampa native worked his way up to 17th. Then several cars in front of him began to pit under the green flag, and Almirola moved up to seventh, where he ultimately finished Stage 1. Almirola began Stage 2 in the 17thposition and ended it in sixth to earn five stage points. The Smithfield driver stayed out during the stage’s only caution period and continued to pass his competitors under the green flag. Several drivers made green-flag pit stops toward the end of the stage, allowing Almirola to move up to sixth to end Stage 2. Before the start of the final stage, Almirola came down pit road for four tires, fuel and adjustments and started the last stage in the 21stposition. Once the green flag waved on the final stage, Almirola went to work passing multiple cars on the 1.99-mile track. He was in the 10thposition when he made a scheduled green-flag pit stop on lap73. Varying pit strategies left Almirola in the 21stwhen he re-entered the track after his pit stop. As pit stops continued to cycle through, Almirola methodically worked his way through the field and was running in the ninth position on lap 86. Almirola eventually maneuvered his way up to fourth on lap 94, his highest position of the race. After cars on fresher tires began to advance through the field during the long green-flag run, Almirola ended the event in the eighth spot. Almirola’s eighth-place finish was his best result on a road course in the Monster Energy NASCAR Cup Series. His previous best was 14that Sonoma in 2015. Almirola finished seventh in Stage 1 to earn four bonus points and sixth in Stage 2 to earn an additional five bonus points. Martin Truex Jr. won the Save Mart 350k to score his 18thcareer Monster Energy NASCAR Cup Series victory, his third of the season and his second at Sonoma. His margin of victory over second-place Kevin Harvick was 10.513 seconds. Twenty-one of the 38 drivers in the Save Mart 350k finished on the lead lap. The next event on the Monster Energy NASCAR Cup Series schedule is the Overton’s 400 on Sunday, July 1 at Chicagoland Speedway in Joliet, Illinois. Coverage of the race begins at 2:30 p.m. EDT on NBCSN.